New Orleans Men in power seem to need to be taught the lesson over and over again that no matter how long they stall and struggle, women will invariably prevail. The tide of history is overwhelmingly moving in only one direction along the path that women shall will it to move. The evidence is everywhere, yet still some resist. Ireland had the most restrictive abortion policy among the twenty-eight countries in the European Union. The balloting recently delivered a 2 to 1 smackdown of the Catholic Church and decades of opposition as women demanded and won the right to choices about their own bodies. Poland is the last holdout in terms of restrictions and still has resisted several efforts to make abortion even harder to achieve. Smart politics would seem to demand that even these conservative, populist elected officials find a way to take these issues off the battlefield. In the end they will lose. Saudi Arabia has arrested at least five civil rights activists who have been supporting the right of women to drive even as the country had won plaudits recently for seeming to relax the restrictions. How can there be a claim to modernity and recognition of the community of nations and its people in a country that hasn’t even reckoned with whether or not women are autonomous beings sufficient to get behind the wheel of an automobile? How can the princes pretend that they are not so out of step as to be objects of ridicule? How can they presume that they will be able to hold power in the future as they resist the tide of history? One United States and United Kingdom company after another is caught in embarrassment when evidence of different pay standards is revealed between women and men. Among Fortune 500 companies there was a report that there were as many male CEOs named John as there were women CEOs across the country. Who seriously believes that pay will not be equalized, and that women’s place will not be achieved? No one in their right mind, I can assure you. Yet, in red state America we read daily of rearguard actions by mossback legislators who still believe that the power of the state should prevent women’s autonomy and control of their own bodies and family decisions. They are committed to such a course even at the risk of the lives and well-being of millions of lower income women who will be denied health services because of their misplaced and atavistic ideologies. They must know their cause is lost, yet they are unwilling to surrender until vanquished. 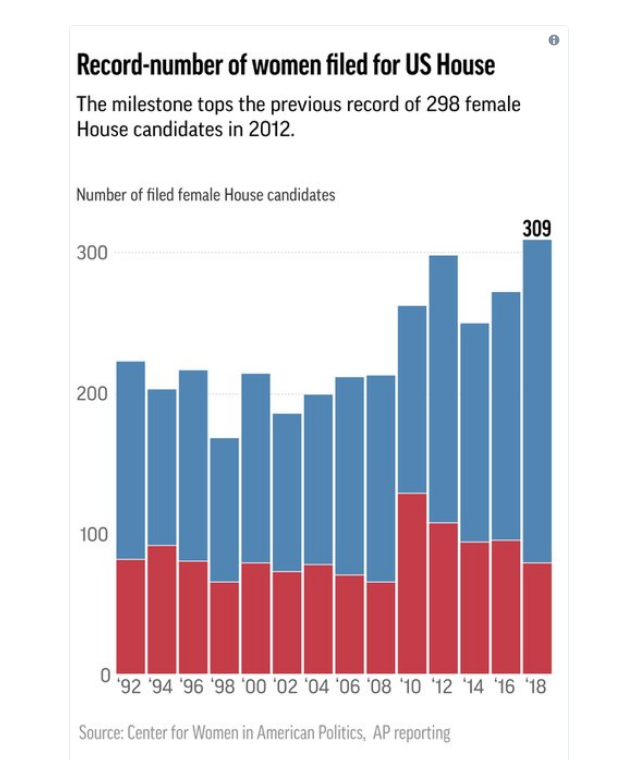 Interestingly in the surge of candidates for the midterm elections, women standing for office dwarf the numbers of men stepping into the resistance. We have years more in which we must aggressively wage this fight, but resistance is futile. Women will win. And, when they win, men will thank them for their courage and celebrate their victory. Mark my words. New Orleans The #MeToo moment may be moving, step by step, in a direction that confronts more than just bad actors and begins to look at the reform of the entire system of sexual harassment, which is simply a manifestation of discrimination, if not outright misogyny. This is good news, even if the debate is unsettled. Susan Faludi argued an effective case in an New York Times op-ed that essentially argued that the moment needed to become a movement, so that its target was not individual men in high profile positions in the arts, politics, and culture, but the very system of discrimination against women that created these vicious and sometimes criminal entitlements that some exercised as licenses for abuse. She argued for a movement that was comprehensive and did something more than trickle down from the elite to the workplaces of the vast majority of women. Right on! Interestingly, her argument and the obvious implication it has for the majority of women, seems to have been also taken up by the women of Hollywood. Widely reported and announced with full-page ads, 300 women ranging from A-list actresses to agents, writers, directors and others in the film industry, launched “Time’s Up” with a $13 million dollar kitty raised within days. Their claim is obviously that they are going to cleanup Hollywood where they work, but they were at least sensitive to their exalted place in the sun, and also committed that they were going to devote energy – and resources – to support women farm workers, janitors, nurses, factory and restaurant workers who face much harder and ingrained systemic abuse. In Hollywood, in the shadow of Harvey Weinstein, it is hard to believe that they can be ignored on their home turf, and that’s not trivial, given the progress that might be made if some real systemic reform there leached into the films they produce. 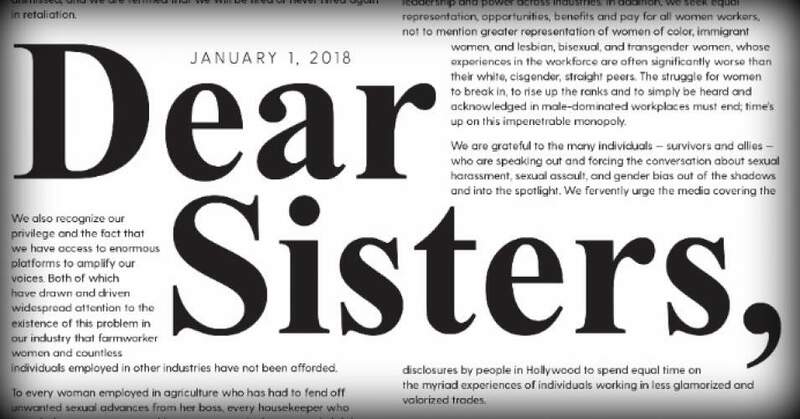 More tellingly than Faludi’s argument was the early open letter from 700,000 women farm workers who had expressed solidarity for the women of Hollywood last fall. This won’t be Jane Fonda marching with welfare recipients in Las Vegas to protest welfare cuts in the 1970s though. The main thrust of their work seems to be a legal defense fund to represent exploited women that will be administered by the National Women’s Law Center’s Legal Network for Gender Equity. The fact that it will be directed by Tina Tchen who served as Michelle Obama’s chief of staff in the White House is encouraging, because we can also hope that part of the edge of their attack and resources might not be sucked into lengthy, time consuming legal efforts but also into the political arena where reform is needed and impact can be immediate. This is all getting serious, and that’s great news. Hopefully more women at the bottom, will force more women at the top, with all of our support, to make these changes from top to bottom to finally have more gender equity and to make it permanent. That would be good for all of us!